Different to the other Raglan surf schools that have 15-40+ people on each lesson and minimal attention to detail, we offer small group surf lessons and courses with constant feedback, correct technique advice and a complete approach with tips on forecasting, understanding waves, land-based training and equipment advice. You will learn more and progress faster with our popular 3 and 5 day 'Become a Surfer' course. We teach you new skills in each surf lesson and ensure you leave Raglan confident to surf and improve on your own. We treat you as an individual and respect your experience, offering you in-water or video coaching to help you surf better by identifying and breaking your bad habits. We have a deep understanding of the issues late starters to surfing face. We also run surf coaching camps for all levels around New Zealand and Indonesia. These are a great way to binge on surfing and improve fast in perfect waves for your level. There are a number of ways you can learn to surf or improve your surfing with UP Surf Coaching. Choose one of the options below or click here to select your surfing level and find what's best for you. Why UP Surf Coaching Raglan? Our surf lessons teach you much more than how to stand up and get you surfing and turning across good size green waves ASAP. Become a well rounded surfer with theory, technique, forecasting and equipment advice. Avoid big group chaos and learn with a maximum of 4 other people. This means you catch more waves, are safer, and your coach can give you more attention, more tips and speed up your progress. This surf school isn't only for beginners, we regularly coach intermediates and experienced surfers too and have hundreds of hours of video coaching experience. We'd love to see you take your surfing to the next level! Many surf schools teach you to get up using your knees or other 2 stage methods. It's easier for the coach but bad for your surfing future and very hard to unlearn later. We only teach correct techniques and if you're having problems improving, we can help. * By the way - Free Photos and Video Clips, Pickups within Raglan and Tips on where to stay are all part of the service when you book on a course. After three days of surf lessons with Andrew, I got the skills I need to be able to progress on my own. In the water he would point out small changes I should do, that got me slightly better for every wave. For me, learning where to look, and how to distribute weight to turn made a huge difference. I have been in the water by myself after the course, and I feel a huge difference; I catch more waves, I understand which to go for and I'm more stable. Learn to surf, not just standing on a board. I did 5 days of surfing lessons with Andrew and it was a great learning experience. I feel that unlike other surf schools that feel like their aim is to just have you standing up, Andrew places a lot of focus on helping you become an overall surfer. He placed much attention on learning the right technique and meticulously observes your progression, while also helpfully critiquing your form. What I appreciated the most, was Andrew's willingness to help you become a better surfer and sometimes this would occur outside the actual surf lessons. 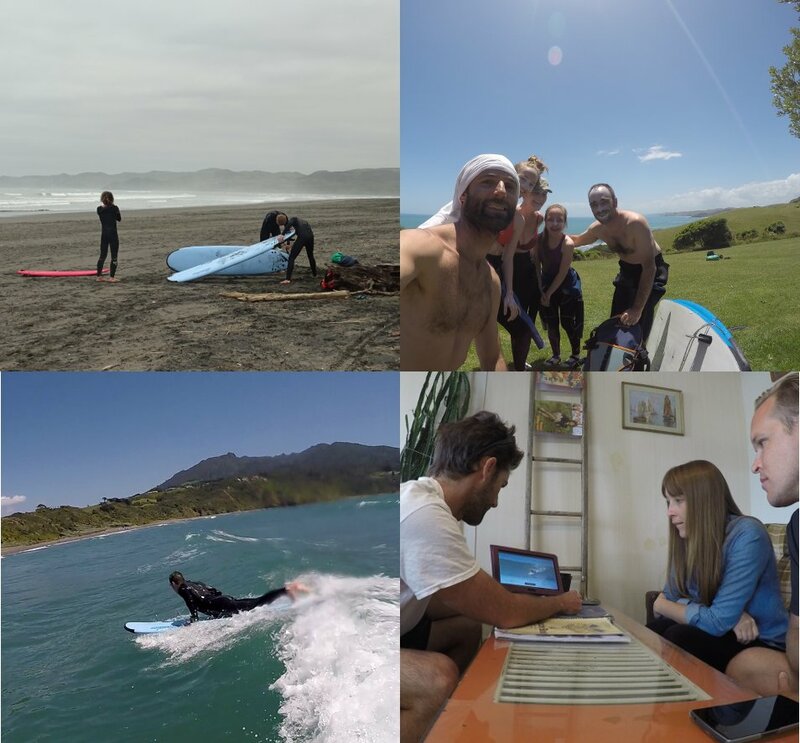 My name's Andrew and after giving surf lessons in Raglan and around the world for years, I started UP Surf Coaching in 2012. I started a surf school because I realised many people wanted to get into or improve their surfing, but they were having a hard time finding coaching that would actually help with this. So I designed a progressive series of lessons and coaching methods that are very effective for late starters of all ages, and the everyday 'average' surfer. We've continued to fine tune these methods and yet we've kept our prices competitive with the stock standard group surf lesson. Raglan itself is a great place to learn to surf. Being on the west coast we get constant swell, yet we are slightly tucked away from the full brunt of the ocean. This means that Raglan doesn't suffer from a lack of waves like New Zealand's east coast, yet the waves here are usually more friendly and more suitable for learning than the waves on Auckland's fully exposed west coast.